The best way to promote BrowZine is to use browzine.com as the link to your journal collection. Click Get Started to see how easy it is! Integrate BrowZine into LibGuides or other subject guides to showcase key journals by subject and get users immediately to content. See how easy it is with our Widget and great examples! We’ve bundled a terrific assortment of BrowZine images you may include in your blog posts, video displays, and wherever you need visuals. Sometimes print is the best way to get attention. We have created a special bundle of material especially for hospital and medical libraries including posters, pins, stickers and more. All free! To request, click the button below. Ready-made tweets, Facebook posts and emails make it easy to promote BrowZine on campus. Check back often; we’re updating this section regularly. Want an easy way to read and monitor scholarly journals? Check out #BrowZine at browzine.com or in the Android or iOS App Store! New article notifications keep you up to date.Download #BrowZine to your iOS or Android device today! Save articles for offline reading with #BrowZine. Access scholarly journals via #BrowZine at browzine.com or on iOS or Android! Library News – BrowZine.com now available for easy access to scholarly journals. Easily read and follow your favorite scholarly journals with #BrowZine from your Android or iOS device and on browzine.com! Stay current in your field of study using #BrowZine to read scholarly journals from your Android or iOS device or browzine.com! 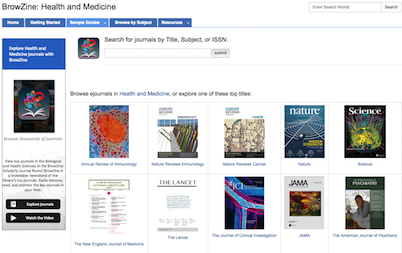 Use #BrowZine to browse and read your favorite scholarly journal. Share articles using Dropbox or many other services. Looking to read your favorite scholarly journal? Find and read it using #BrowZine, now available on campus at browzine.com! Examples of tweets to highlight specific users, content and subject areas. Tailor these with what BrowZine users can find in your BrowZine library. Not sure, contact us and we’ll help! Health Sciences – Have you downloaded #BrowZine yet to your iOS or Android device? The library is now sponsoring BrowZine. BrowZine is a great new service that allows you to discover, browse and read the library’s top scholarly journals, in a fast and easy to use system at browzine.com! Find similar journals available from your library to give you ideas for new paper topics, places to publish or to just raise your awareness of what is being discussed in your field. Get started by just going to browzine.com. If you want to bring the BrowZine experience with you, download the BrowZine app for iOS or Android as well! Follow Third Iron on Twitter and Facebook to receive immediate #BrowZine updates that you can retweet or pass along to your users via social media! Start this year with BrowZine! The library is excited to offer faculty access to our scholarly journals through BrowZine. BrowZine is a service that allows you to browse, read and follow scholarly journals in a beautiful visual display. • Save and export articles: Use the BrowZine app to save articles for off-line reading or export to services such as DropBox, Mendeley, RefWorks, EndNote, Zotero, Papers and more. Get started today! Simply visit browzine.com or download the app from the Apple App Store, Google Play Store or Amazon App Store. Have you tried BrowZine yet for keeping up with your scholarly journals? Do you know you can create a personal My Bookshelf account to follow your favorite titles and be notified when new articles become available? Customize your own bookshelf at browzine.com or download the app from the Apple App Store, Google Play Store or Amazon App Store and download the app for free. Don’t forget about Browzine for staying up to date with your journal reading! Best of all, Browzine is available on the web or your iOS or Android device, so you can download articles and read them on the go. Try it now! Simply visit browzine.com or download the app from the Apple App Store, Google Play Store or Amazon App Store and download the app for free. Downloadable posters are a great way to promote BrowZine on campus. Hang them in high traffic areas of the library and campus community. The below poster highlights BrowZine on a device and is great for use in a window or printing small as take-away brochures. Click on the link below to download the files! Non-editable PDF Format. Suitable for printing with some suggested text that can be easily modified for either a trial or a subscription. Both light and dark variations included. Available for editing in Microsoft Word or Adobe Illustrator (.ai). Announce the availability of BrowZine with our customizable emails. Easily insert smart banner code to your library webpage. When users visit your library webpage with their tablet, they will be instantly notified BrowZine is available. To add a smart banner to your library webpage, place the below code on whatever page you want the banner to appear. That’s it! The browser will now detect if users are on an iPad or Android tablet and display this message, regular desktop users will not. The A-Z list is a great place for the Smart Banner!